Carotid arteries are blood vessels that carry oxygen-rich blood from your heart via the aorta to your brain. There is one located on each side of your neck. The carotid arteries supply blood to the large, front part of the brain, which controls thinking, speech, personality and sensory and motor functions. The vertebral arteries run through the spine and supply blood to the back part of the brain (the brainstem and cerebellum). A healthy carotid artery is smooth, widely open and not narrowed on the inside, and allows blood to flow freely to the brain. As we get older plaque (a sticky substance made of fat and cholesterol) can build up inside the carotid arteries. This plaque can narrow the inside of the artery and the condition is known as carotid artery disease. The process of plaque build up (termed atherosclerosis) is the same as for that in the heart (causing coronary artery disease and heart attacks) and in the legs (causing peripheral vascular disease and leg pain). Carotid artery disease is serious because it can lead to strokes either from obstruction of blood flow to the brain by the plaque or when pieces of the plaque and clots break off away from the plaque and flow to the brain. This interruption of blood flow to a part of the brain leads to a lack of oxygen and other essential nutrients to that part of the brain and may lead to stroke. Stroke is the second leading cause of death in Australia as per the Australian Bureau of Statistics. 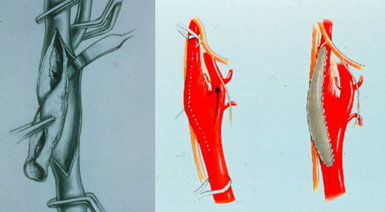 Figure 1 presents operative images from patients with carotid artery disease demonstrating the appearance of the disease from both the outside as well as the inside of the artery. A TIA is a medical emergency, since it is impossible to predict if it will progress into a major stroke. If you or someone you know experiences these symptoms, get emergency help. Immediate treatment can save your life or increase your chance of a full recovery. TIAs are strong predictors of future strokes; a person who has experienced a TIA is 10 times more likely to suffer a major stroke than someone who has not experienced a TIA. A stroke occurs when a blood vessel in the brain becomes blocked or bursts. The brain cannot store oxygen, so it relies on blood vessels to provide it with blood that is rich in oxygen. A stroke results in a lack of blood supply, causing surrounding nerve cells to be cut off from their supply of nutrients and oxygen. When tissue is cut off from its supply of oxygen for more than 3 to 4 minutes, it begins to die. 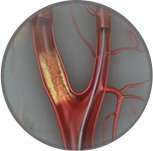 Contact Specialist Vascular Clinic if you are having symptoms of carotid artery disease. Early detection of carotid artery disease is important so the right treatments can be provided before the disease becomes severe enough to lead to complications such as stroke. A thorough history and physical examination is performed in our office. The specialist doctor will listen to the arteries in your neck with a stethoscope. An abnormal rushing sound, called a bruit (pronounced BROO-ee), may indicate carotid artery disease. However, bruits are not always present when there are blockages, and may be heard even when the blockage is minor. A Duplex ultrasound is a simple, non-invasive test used to examine blood circulation. This test may be used to detect a blockage in an artery. It has a high degree of accuracy for detecting carotid artery stenosis when performed by a dedicated vascular sonographer. In other words the degree of accuracy is dependent on the experience of the person who is performing the ultrasound scan. Generally this is the first test that will be performed. 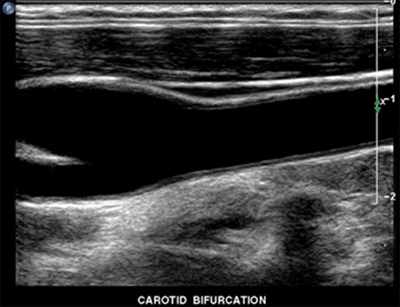 Figure 2 demonstrated the appearance of a healthy carotid artery on ultrasound. During angiography contrast material (dye) is injected into the blood vessels being examined, and X-ray pictures of the inside of the blood vessels are produced to evaluate blood flow and detect possible blockages. This is generally the most accurate method of detection but can only give information about the inside of the artery. 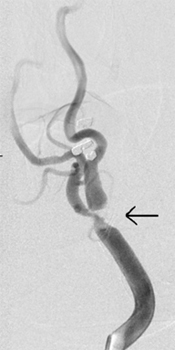 Figure 3 demonstrates an angiogram of the right carotid artery with a high grade stenosis (severe narrowing) caused by carotid plaque build up. This patient experienced transient flashing lights in the eye. 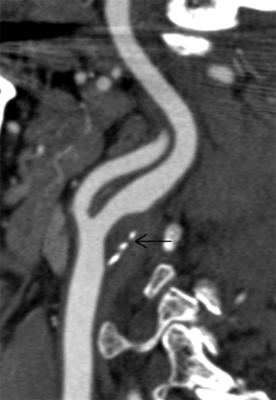 Figure 4 reveals the CT scan appearance of a smooth plaque in wall of the left carotid artery (arrow). Lifestyle changes, medications, interventional procedures and open carotid surgery are the treatments available for carotid artery disease. All patients with carotid artery disease should take an anti-platelet medication to reduce the risk of stroke and other cardiovascular disease complications. The most commonly used anti-platelet medication is aspirin. Others include clopidogrel (Iscover, Plavix). 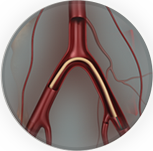 Carotid artery disease can be treated with minimally invasive endovascular surgery http://my.clevelandclinic.org/services/atherectomy/vs_atherosclerosis_atherectomy.aspx to place a stent in the artery. This procedure is performed under local anaesthesia with sedation without the need for a full general anaesthetic and is performed via a needle in the groin. It does not require surgical incisions or wounds and requires 2 days in hospital on average. The procedure is well tolerated with a rapid return to recovery. The benefits in terms of improved blood flow and protection from stroke are realised immediately after the procedure. Endovascular surgery is extremely well tolerated even by patients who have been told they are too old or frail for conventional surgery. Figure 5 depicts an intra-procedural angiogram of a patient with a left carotid artery stenosis being treated by carotid artery stenting under embolic protection. Note the stent positioned in the carotid artery at the area of narrowing and plaque build up. The stent is still constrained at this point prior to being released (arrow). The procedure is performed under the safety of an embolic protection device - note the filter basket above the stent (arrow head). 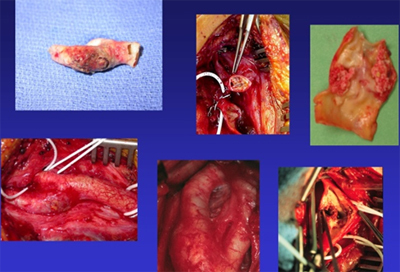 Carotid endarterectomy is the traditional surgical treatment for carotid artery disease. Carotid endarterectomy has been proven to be beneficial for symptomatic patients with a 50 percent or greater carotid stenosis (blockage) and for asymptomatic patients with a 60 percent or greater carotid stenosis. Carotid endarterectomy can be performed under general anaesthesia (the patient is asleep) or local anaesthesia with intravenous sedation. During the procedure, an incision is made in the neck at the site of the carotid artery blockage. The surgeon removes the plaque from the artery and when the plaque removal is complete, the surgeon stitches the vessel closed. Blood flow to the brain is restored through its normal path. Figure 6 depicts carotid endarterectomy (CEA) where the carotid artery is opened and plaque removed. 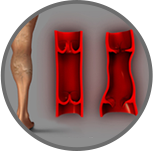 The artery is then closed using a patch to minimise the risk of re-narrowing in the future.